Last week, I got to film a web show with Emeril Lagasse–whose reality series “On the Menu” premieres tonight on TNT–himself. Unlike most of my Wednesdays, shoot day started with hair and make-up, a dozen cameras and camera operators, and a gorgeous studio at the Starrett-Lehigh building, on the Martha Stewart floor. It was so much fun. Of course by the time I was actually in front of the cameras beside Emeril, prepping spicy cocktail nuts with the seasoned TV host, my shyness struck, and I couldn’t think of anything to say. Make small talk? Um, er, um… Gone was my ability to rhapsodize about anything delicious. Instead, I smiled, nodded, laughed, and beat some egg whites. I adored the experience, but I’m also not all that disappointed to be back on the other side of the camera, watching Emeril on his new show, “On the Menu.” (It’s on tonight, October 3rd, at 8/7c.) 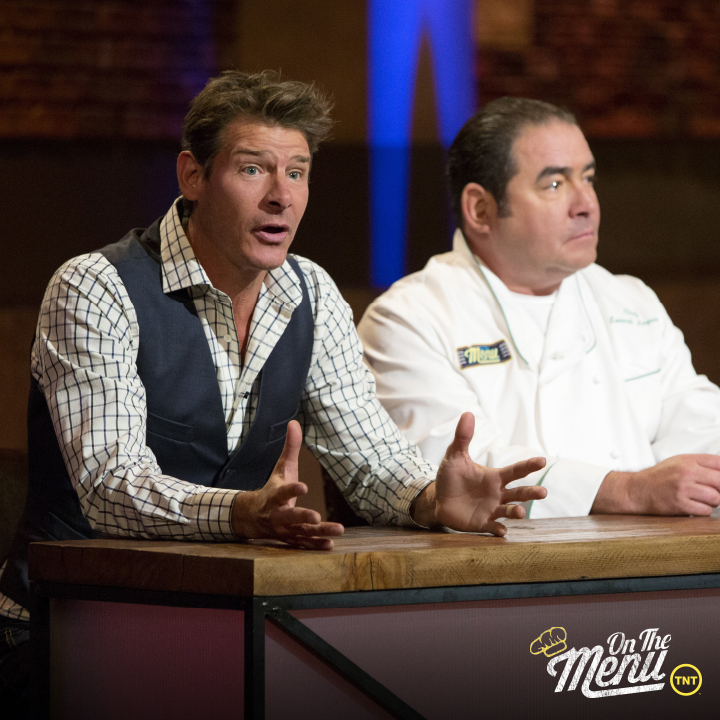 Chef Emeril Lagasse and Ty Pennington are hosts on the new competition show, where contestants try to create the next dish to appear on the menu of national restaurants like California Pizza Kitchen, among others. That means viewers can actually try the winning dish! Back at home, I’ve made something to celebrate: an Emeril-inspired recipe for spicy cocktail popcorn. See, when he and I were filming the show together, the only thing I could think to say about last-minute cocktail food was, “I always have popcorn in the pantry.” So clever, I thought sarcastically to myself as I kept on beating the egg whites, which were going to become the coating on a set of mixed cocktail nuts. Later, I realized I wasn’t as tongue-tied as I thought: popcorn really would be good with the same spicy-sweet treatment. And so that’s what I made you to nosh on while watching the show’s premiere. I hope you like it! This post is sponsored by TNT’s “On the Menu.” All opinions and text are mine. You can check out a preview of the show here. Thanks so much for supporting the sponsors that keep Big Girls, Small Kitchen delicious. Use your favorite Southern or Southwestern-style spice mix. I get some as gifts so usually have something lying around. If you don’t have anything on hand, just mix up a little paprika, cumin, coriander, and oregano and call that your mix. The cayenne is optional because your mix may already be spicy; if it is, skip the hot pepper. Heat a small lidded pot over medium heat for about 2 minutes. Drizzle in enough oil to coat the bottom, then add 2 popcorn kernels. When they pop, add the rest, then put the lid on the pan and shake the pan to distribute. Cook, shaking occasionally, until all the kernels are popped, about 5 minutes. Transfer the popped corn to a parchment-lined pan to cool slightly. In a large bowl, whip the egg white with the water until foamy and thickened. Add the sugar, spice, and 1/4 teaspoon salt, and whisk to combine. Add the popcorn, then fold to coat each piece in the egg white-spice mixture. Taste for salt (if you’ve used good-quality egg whites and aren’t afraid to try ’em), then return the popcorn to the parchment-lined sheet. Bake for 45 minutes, tossing the popcorn every 15 minutes, until the coating has dried. Cool slightly, then serve warm or room temperature. As mentioned above, this is a sponsored conversation written by me on behalf of TNT. The opinions and text are all mine. Here’s a quick q the sponsors would love if you answered! This looks delicious! Can’t wait to see you on Emeril. How freaking fun is this?!?! So jealous of you right now…but happy as well, of course. Yummy recipe! You’re such a celebrity! I can’t believe you got to meet him. I think popcorn is a great idea for a get together. 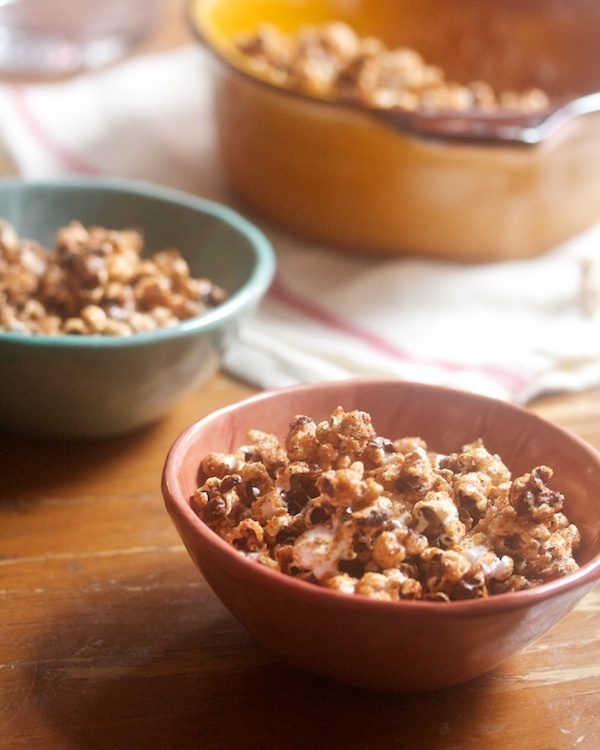 Everyone loves popcorn, and your sweet & spicy stuff looks amazing. Have you ever been to 4th ave. pub? They have that popcorn machine with old bay! It’s incredible and my friends always love going there because of the popcorn. Popcorn is my favourite snack – so easy and tasty!